The DomeShelter structures from AWP Group are available in a container mounted option to meet large storage requirements with complete weather protection. The container mounted DomeShelters offer innovative heavy industry storage solutions that are highly cost-effective, involve simple installation and dismantling, and offer industrial strength for heavy duty storage. Container mounted Shelters can be customised to specific requirements based on single or double height, one to three deep with the frame size provided to suit. The client’s choice of container type determines the nature of the storage zone, with additional storage or offices opening directly onto the main space. 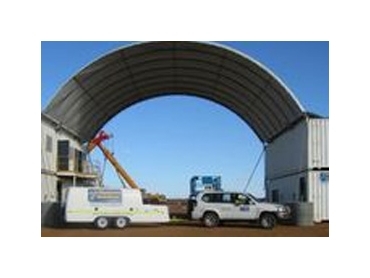 Purchasing managers prefer these Dome Shelters for several very good reasons. In addition to making good use of temporarily de-commissioned containers, the container-mounted DomeShelter can be installed easily with no foundation laying or post-erection work required. The container mounted storage structures are ideal for time-limited projects as they can be dismantled quickly.